Darksiders III feels late to the party in many ways. The seemingly short-lived Darksiders series last saw a new entry all the way back in 2012 with Darksiders II, but Vigil Games went defunct the next year, putting the future of the series in murky waters for several years. However, out of the ashes of THQ's messy bankruptcy rose THQ Nordic and Gunfire Games, who after releasing the absurdly named Deathinitive Edition for Darksiders II, went right to work on another title in the series. 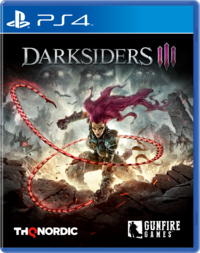 Darksiders III is a parallel sequel to the original game, somewhat similar to II before it. The next horseman in the saddle is Fury, the short-fused sister of War, Death, and Strife. Between the prologue and main portion of War's adventure in the first game, Fury is sent off by the Charred Council to gather up the Seven Deadly Sins, who had freed themselves from captivity upon the events that had taken place. Fury meets up with a few familiar and several new faces of the original game, and the setup seems very diversionary right from the outset, but it's enough motivation to start seeking out some truths behind the war between Heaven and Hell. Darksiders as a series is a weird one, because many components that would be shared traits in any other series are somewhat more distinct in each entry here. Darksiders was an obvious Zelda-like, complete with bespoke dungeon areas with maps and compasses, along with a unique boss and weapon in each. Darksiders II holds onto many of the same ideas in broad strokes, but removes many of the linear Zelda-style upgrades with a randomized and color-tiered loot and gear system, more reminiscent of Diablo. The combat also borrowed heavily from games like God of War -- the original, that is. However, the general progression and dungeon structure remained largely the same. Darksiders III's obvious inspiration is incredibly evident. For instance, your primary healing item is a refillable relic whose number of charges and potency of healing can be increased by finding upgrades for it. Items are used by crushing them in your hand. Each area has red-eyed enemies dotted around in nooks and crannies guarding valuable items, and they don't respawn. Enemies all drop souls which act as the game's currency and can be also traded in as experience. Items are all glowing orbs on the ground, often in corpses, to be revealed only upon being picked up. Many of these items are bundles of souls that can be used to add to your current amount. Upon death, you'll leave behind all your souls to be picked up after you respawn next. Weapons are upgraded using slivers of materials, followed by fragments, pieces, and finally chunks. Bosses now have named health bars that go across the whole bottom on the screen, and so on. The most striking of these changes is the world design itself. Gone are the delineated dungeons of Darksiders, and instead we have six regions, each with various bosses and pathways, intertwined into one mostly seamless world. Comparing something to Dark Souls is always a bit tenuous -- it's a high bar for any game to emulate well, and Darksiders III falls a bit short, perhaps expectedly. However, it does feel like an appropriate decision for the series, execution notwithstanding. While the world design of Darksiders III is perhaps more Dark Souls 2 then Dark Souls, there's enough cleverness here that it feels like a net improvement over the style found in the first two games. Adhering to the design philosophy fully, Darksiders III is the first game in the series to forgo having a minimap, or a map of any sort. Combined with winding areas with multiple entrances and one-way gates, this means having a strong mental map is necessary to avoid getting lost. While not having a map felt awkward at first, it does lead to the genuine feeling of relief when you find that a certain passage leads back to a familiar room from several hours prior, or finally figure out how to acquire those items orbs that often sit tantalizingly out of reach when you first explore any given area. There's also a strong internalized sense of progression when you can look up from the dregs of a location like the Bonelands and see a church way up on the periphery that you had explored previously. Some of the game's early bosses also don't have quite a fixed order, though you may have to go out of your way to not follow the recommended path to see that this is the case. Disappointingly, despite some of the cleverness of the world design present, the limited number of regions and similar designs between them result in the world feeling a bit smaller than it actually might be. The Nether is an insect's hive that's taken root in an old abandoned subway station, but there's similar design in the Depths area with train cars and warehouses, which can be found again in the Bonelands. Combined with a general aesthetic that looks a generation outdated, there's not a lot to like here about the game's visual presentation, outside of a few set moments. On top of this, some of the regions railroad players into a very linear progression -- The Scar only has one entrance and is a series of rooms mostly played in a set order. While Darksiders III does have its share of gates and shortcuts like any good souls-like, it complements this design with lock-and-key progression most similar to something like Metroid Prime. Like Samus's four elemental beams, Fury ends up with four elemental transformations called Hollows, each allowing access to multiple regions in multiple ways. For instance, the Fire Hollow allows Fury to triple jump to high ledges, but also allows her to burn down webs. The Stasis hollow allows her to walk on water, and also wall jump between certain colored walls. These powers can be combined to triple jump from standing atop a body of water. It definitely has a good feel to it, and it all ends up being far less cumbersome that gear swapping the Zelda-like equipment options in the original Darksiders. Each Hollow element can be transformed to and from any other, which is useful both for traversal as well as for combat. Each Hollow comes with a unique weapon attached, which can be upgraded independently. Every weapon, including Fury's whip and boomerang, all take the same materials to upgrade so there's definitely a bit of playing favorites required, don't expect to max out everything. Fury controls very similarly to War, and many of the controls of the original game carry over here. However, Fury cannot block any attacks, instead relying on well-timed dodges to avoid damage. Wrath and Havoc (Analogous to War's Chaos) abilities also return in similar forms. Instead of having to equip Wrath abilities from a menu like before, each Hollow form has its own ability, ranging from Fury self-immolating in Fire Hollow to cause damage over time to nearby enemies to Thunder Hollow's ability to launch tornados to act as effective crowd control. Havoc acts in a similar manner as War's transformation in the original game, serving as an invulnerable beast form that's useful in the most heated situations. Altogether, the several combat tweaks made with the four transformation options, Wrath abilities, multiple weapons, and emphasis on dodging instead of tanking damage all combine to make for a remarkably engaging experience. Enemy approaches are also pretty varied, with some ranging from melee brutes that want to get in your face with big slow weapons to archers and acid-spitters that you'll need to close the distance on in order to damage. The only drawback is that with a combined pool of resources called Adamantine to upgrade weapons, you'll probably want to upgrade Fury's whip the most when starting out, since you can use it in any form. This means you might be spamming basic whip attacks without delving into the hollow specific weapons and abilities until you're able to gather enough materials to also upgrade some other options in parallel. There's also a huge incentive to revisit old places once you've got more abilities and Hollow transformations under your belt. Not only does this result in the typically expected payout of more souls and crafting items, but there's a handful of optional mini-bosses as well. Again though, Darksiders III falls a bit short in scope -- many of these mini-bosses are similar larger recolors of regular enemies, rather than being wholly unique. While there are components to like with a few drawbacks in terms of the combat and world design, the same cannot be said for the game's narrative and story. From the outset, Fury's story feels diversionary, transparently something to occupy her time during the events of the original game. On top of that, Fury might be the least charismatic protagonist I've encountered in a long while. While some of this can be handwaved as being written into her identity, nothing interesting is done with the persona either. From immediately going on about how she's destined to lead the horsemen, to tritely telling her Watcher companion that "it's all in the wrist" after moving a large object, I never found myself rooting for her. During several needless sections where Fury and the Watcher slow down to a crawl to update the game's threadbare story, the Watcher constantly suggests that Fury's demeanor is softening and that she seems different, only to be constantly rebutted with so many words that never really boil down to anything more than "I guess, maybe." To make matters worse, seemingly important plot points are dropped before being resolved, some motivations are never made clear, and ruminations about being betrayed and the truth behind the game's events are never really laid out. It's possible that some of these weird issues will be addressed if the series continues into future games, but within Darksiders III, it makes it hard to care about the ongoing story. Combined with a remarkably edgy yet bland protagonist and an inconsequential parallel plot, this isn't the game to look for if you're invested in the lore built up by the first two titles. If you're able to put those narrative shortcomings aside, there's a fair bit to like about Darksiders III. When compared to some of the most critically and commercially acclaimed video games of all time, it seems to fall well short, but perhaps that bar was never in reach. Judged on its own merits, Darksiders III combines interesting combat, clever map design, and engaging progression, though you may have to look past a lot of bland environments and go in with expectations in check in order to fully appreciate it.